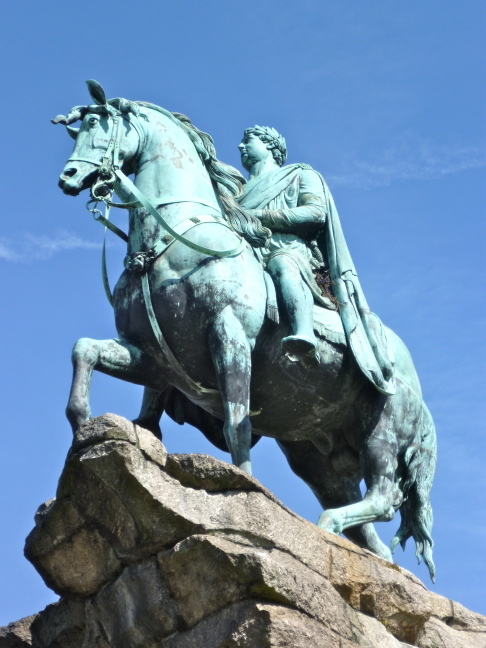 The Copper Horse (Monument to George III) by Sir Richard Westmacott (1775-1856) 1824-30; erected October 1831. 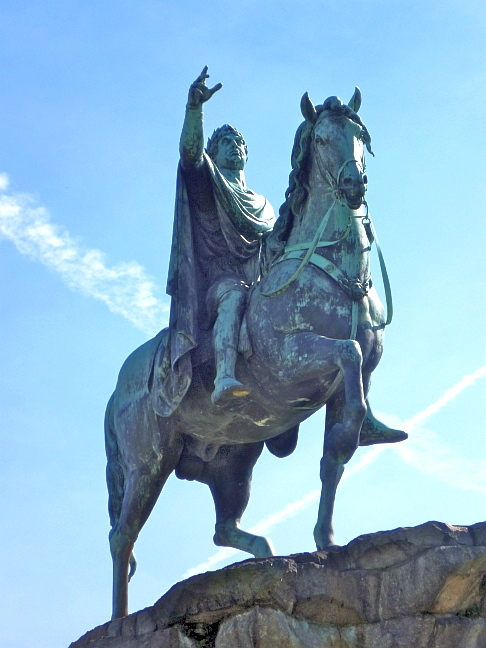 Bronze, on a rocky platform in Snow Hill, Windsor Great Park, in the grounds of Windsor Castle. 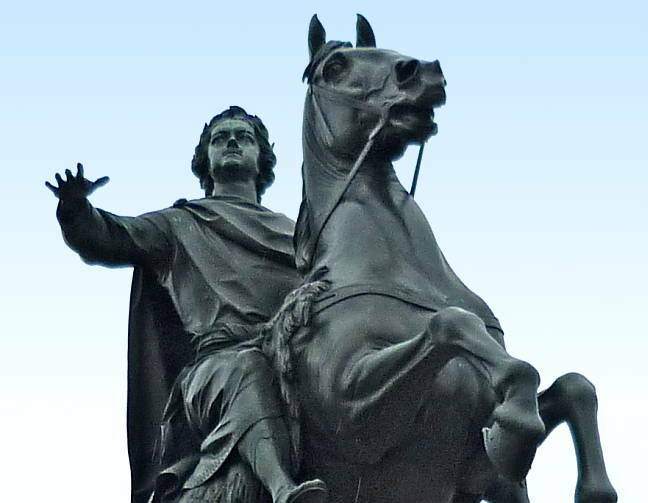 George IV commissioned this statue in memory of his father George III, and it was clearly intended to emulate Étienne-Maurice Falconet's late eighteenth-century equestrian statue of Peter the Great in what is now called Decembrists Square, St Petersburg. In fact, the two works make an interesting contrast. The French sculptor worked in St Petersburg from 1766-78 and caught the mood of the times, working with "Baroque conventions for movement" (Geese 254). His horse is treading down a snake (variously explained as Sweden, problems, and evils) and rearing, as if to launch itself and its rider forward and upward. The rider himself has his hand emphatically spread as if to shield, quell or subdue. The result is "a sculptural symbol of an entire epoch of Russian history" which "fuses energy and many aspects of the Emperor — Creator, Reformer and Lawmaker — into one" (Popova 36). The English sculptor's horse, on the other hand, looks constrained, almost as if it is performing a dressage exercise, and George III, despite his laurel crown, seems to be trying to grasp something beyond his reach. The rocky bases are very different too. Seen from below, George III's steed seems to be climbing, but it is actually on a level pile of slabs on a hill with other stony outcrops; it is therefore less resonant of difficulties overcome, and carries no suggestion of the wave of the future, to be majestically crested. As for the two statues' settings, each is spectacular in its own way, and each is also redolent of human achievement. Both are in parks, but Decembrists Square is bounded by St Isaacs Cathedral, the Senate and Synod buildings, and the Admiralty, with the Academy of Arts across the river. 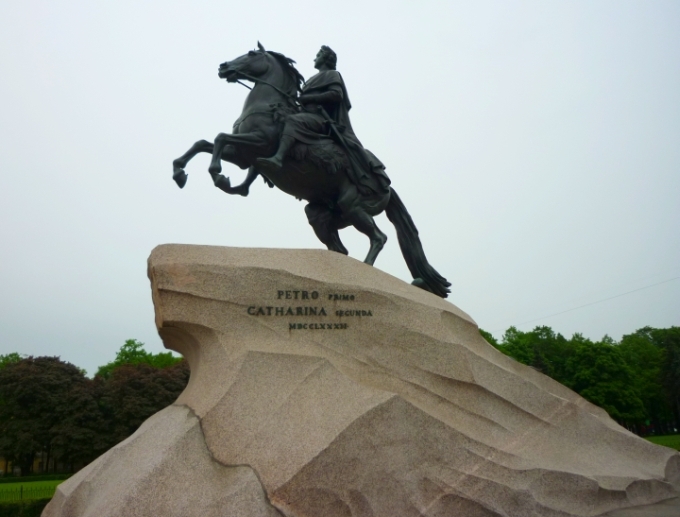 Here are all the symbols of power and cultural refinement to which Peter the Great successfully aspired. The monument to George III, on the other hand, was sited to "close the vista" from Windsor Castle (Morshead 85). 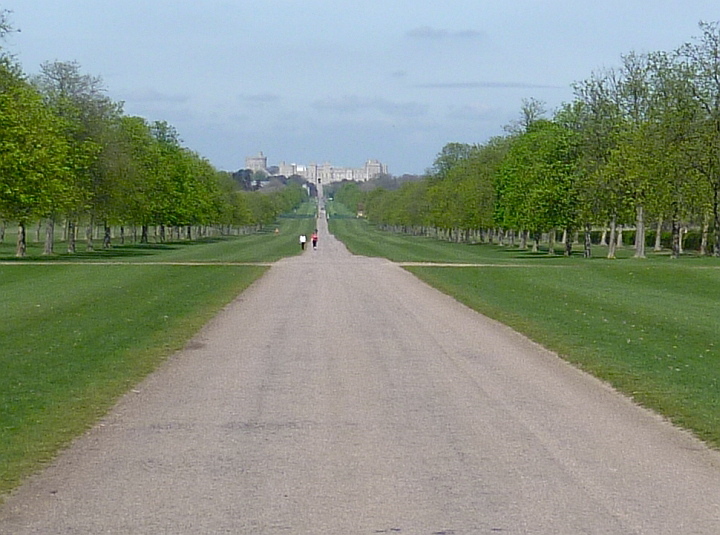 It overlooks the "Long Walk" through a mild and expansive landscape roamed by deer and pheasants, a pastoral idyll of the kind loved by the British monarchy and people alike. In short, despite his statue's Roman garb, Westmacott's huge high-profile monument on Snow Hill is in all points quintessentially English. 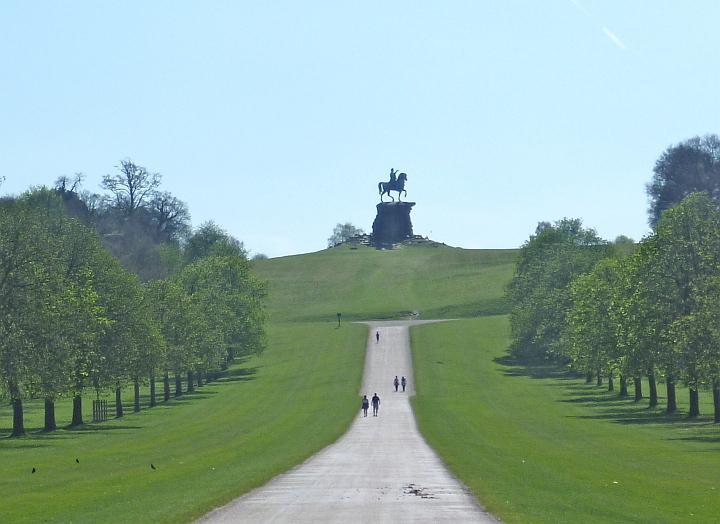 In its technical skill and size, it also represents a milestone in British equestrian sculpture, and was probably the most important of the works which "helped revive the craft of bronze casting in Britain" (Busco). Busco, Marie. "Westmacott, Sir Richard (1775-1856." Oxford Dictionary of National Biography. Online ed. Web. 16 April 2011. Geese, Uwe. "Neo-Classical Sculpture" Neoclassicism and Romanticism: Architecture, Sculpture, Painting, Drawing, 1750-1848. Ed. Rolf Toman. Cologne: Könemann, 2000. 250-317. Morshead, Sir Owen Frederick. Windsor Castle. London: Phaidon, 1957.